Polaris Pumps offers a complete product range of submersible pumps for applications in the Steel Producing Industries. Our larger 8” and 10” pumps in both Low and Medium Head configurations have been the pump of choice for some of the premier Steel producers in the United States for years. Configured in order to precisely meet our Steel Producing customer’s requirements, our pumps will guarantee a successful installation with minimal down time. With our wide range of sizes, High Chrome abrasion resistant white iron wet end components and our line of duty configurable motors, we are able to assemble a pump package for most areas and applications in today’s steel plants. 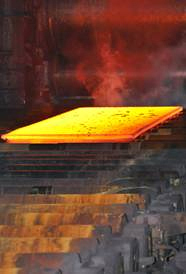 Download Steel Producing Application brochure here.